Living with domestic abuse harms children in many ways. How, and how deeply, children are affected depends on many things: the child’s age and gender; relationships with supportive, non-abusive adults; length of time the abuse has been going on; natural level of resiliency; and exactly what happens. We care about you and your children. We want you all to feel safe, and not only survive your situation but overcome it, so that your history is not your destiny. We’re here to listen and to help. Call our helpline and we’ll talk through some options. Reinforce the fact that abuse and violence are not okay. Reassure the child that the abuse is not his or her fault in any way. Listen to the child’s fears and feelings. Explain that people can disagree with respect and without violence. Assure the child that he or she is loved. Seek out extra support from another adult both you and the child trust. Get professional help if you see signs of emotional or behavioral issues. Teach the child how—and when—to call 911 for help. Watch a short video about children and domestic abuse: WABI-TV’s “Children of Domestic Abuse,” part 1. Directly: The children, too, may be physically, emotionally, verbally, or sexually abused and/or neglected. Overall, the two people they look to for love and trust are an abuser and victim. What do children learn from exposure to domestic violence? Violence is an appropriate form of conflict resolution. Violence has a place within the family interaction. If violence is reported to others in the community, including mental health and criminal justice professionals, there are few, if any, consequences. Sexism, as defined by an inequality of power, decision-making ability, and roles within the family, is to be encouraged. Violence is an appropriate means of stress management. Victims of violence are, at best, to tolerate this behavior and, at worst, to examine their responsibility in bringing on the violence. What emotional reactions might children have from exposure to domestic violence? There are several reactions that children from violent homes are likely to show. The same emotional reaction can be acted out differently according to the child’s age. Children also experience guilt over the good feelings they have about the abuser. Not knowing how one feels or having two opposite emotions at the same time is very difficult for children. A child who says, “I don’t know how I feel about it,” may not be hedging but rather is confused about feelings. A significant percentage of witnessing children are also abused. They may worry that the abuser will find them and abduct them or that the abuser will be angry and retaliate when they return home. 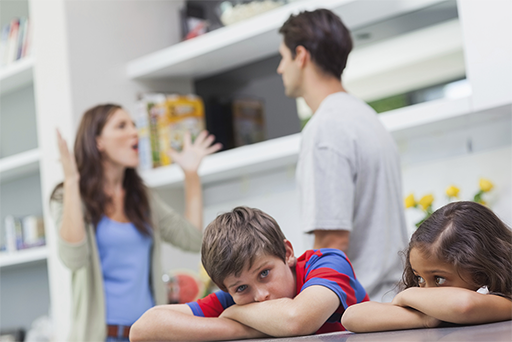 What can I look for if I think a child may live in a home where there is domestic violence? Below are some of the problems that might show up at home, school, or another family setting when a child sees or hears violence. These same problems can also come up because of other things. If a child you know has several of these problems, witnessing violence may be one of the causes. How can I help a child who is in a home where domestic violence is present? Healing begins with supportive relationships. A helpful, supportive adult is the most powerful tool that we have to help children feel safe. Give children permission to tell their stories. It helps children to be able to talk about the violence in their lives with trusted adults. Give clear, simple explanations about scary events. Young children think differently than adults. They do no really understand the causes of violence and will often blame themselves. Help children to know what to expect. Have rules and routines so children can predict what will come next. Build self-esteem in children. Children need daily reminders that they are lovable, competent, and important. Teach alternatives to violence. Help children learn to solve problems and play in nonviolent ways. Model nurturing in your interactions with children. Be a role model for children by resolving issues in respectful and nonviolent ways.